Lake Barco is a lake in Putnam County, Fl, United States. It is roughly circular, about 200 metres (660 ft) in diameter. 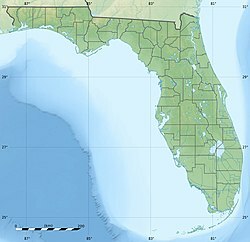 The nearest settlement is Melrose, Florida, about 5 kilometres (3.1 mi) to the northwest. Lake Barco is a sinkhole lake, typical of the region, where unconsolidated deposits on the surface have slumped into the highly soluble limestone of the upper Floridan aquifer.The organic-rich sediments of the lake bottom lie on an unconfined aquifer made up mostly of sands. Below this are the unconsolidated clays and sands of the Hawthorn Group, through which water can penetrate, and below this the Ocala Limestone of the upper Floridan aquifer. The lake has a mean annual temperature of 20 °C (68 °F) and median rainfall of 1,280 millimetres (50 in). It is recharged throughout the year. The lake is fed from the north and northeast by shallow groundwater, which seeps out towards the west and south. Deeper groundwater also flows below the lake. From deuterium and oxygen-18 isotope dating it is evident that some water evaporates from the lake, while other water flows downward towards the Ocala limestone. The lake seems to have started to become more acidic around 1950 due to absorption of sulfate (SO4) created by industrial processes from the atmosphere. The lake modifies the chemistry of the water that flows through it. As the water moves through the sediments in the lake bottom, which are rich in organics, the water is depleted in oxygen. ^ a b c Mueller & Helsel 1996, p. 52-53. ^ a b Fitts 2012, p. 488. ^ Kendall & McDonnell 1999, p. 766. ^ Sullivan 2010, p. 93. Fitts, Charles R. (2012). Groundwater Science. Academic Press. ISBN 978-0-12-384705-8. Retrieved 2013-07-22. Kendall, C.; McDonnell, J.J. (1999-01-11). Isotope Tracers in Catchment Hydrology. Elsevier Science. ISBN 978-0-08-092915-6. Retrieved 2013-07-22. Mueller, David K.; Helsel, Dennis R. (1996). "Field Studies of Karst Terrain". Circular. The Survey. Retrieved 2013-07-22. Sullivan, Timothy J (2010-12-12). Aquatic Effects of Acidic Deposition. Taylor & Francis. ISBN 978-1-56670-416-8. Retrieved 2013-07-22. This page was last edited on 16 July 2017, at 04:45 (UTC).